Watch our Sky-High Brunch Bake video to learn how to wow the crowds at brunch! Our Sky-High Brunch Bake features bacon, cheesy eggs, spinach and more. You'll be sure to have a little something for everyone next time you host brunch. Unfold pastry sheets. Roll out 1 sheet to 11-inch square; set aside. Roll out remaining sheet to 12-inch square; use to line bottom and side of 9-inch springform pan sprayed with cooking spray. Reserve 1 Tbsp. eggs for later use. Mix remaining eggs with ricotta, hot sauce and spinach. 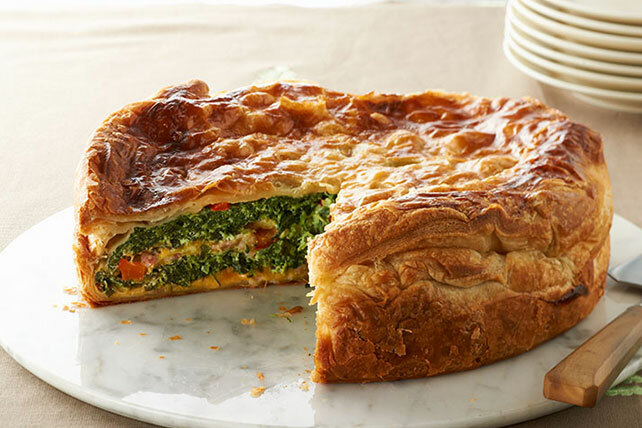 Layer half each of the bacon, cheddar, ricotta mixture and peppers in crust. Repeat layers. Bake 45 to 55 min. or until golden brown. Cool 10 min. Run knife around edge of pan to loosen crust before removing rim. Your family will know it is the festive season when this special morning dish is served. Remember to balance your food choices throughout the day so you can enjoy a serving of this indulgent dish. Prepare using OSCAR MAYER Natural Smoked Uncured Bacon. For added convenience, this morning favorite can be baked ahead of time. Cool, then refrigerate several hours or overnight. When ready to serve, bake, uncovered, in 350°F oven 30 to 40 min. or until heated through. Prepare using 1 pkg. (14.1 oz.) ready-to-use refrigerated pie crusts (2 crusts). If you don't have a springform pan, this recipe can be baked in a 13x9-inch baking dish instead. Roll out bottom and top pastry sheets to fit the dish. For ease in serving, line empty baking dish with foil, with ends of foil extending over sides. Spray with cooking spray. Prepare crust and fill with ingredients as directed. Bake in 350ºF oven 35 to 40 min. or until golden brown. Let stand 10 min. Use foil handles to lift pie from dish before cutting to serve.